Earlier in the day, the two Russian cosmonauts began their six-hour spacewalk, intended to investigate the causes of the leak. They are expected to perform the first-ever operation to unseal the thermal insulation in space. Kononenko is wearing the red-striped Orlan spacesuit, and Sergey Prokopyev - a blue-stripped one. A TASS correspondent reported from the Russian Mission Control Center that Kononenko adjusted his feet to the the tip of Strela boom operated by Sergey Prokopyev. The crane may extend to the length of 15 meters and can be used to transfer objects along the full length of the Russian orbital segment. 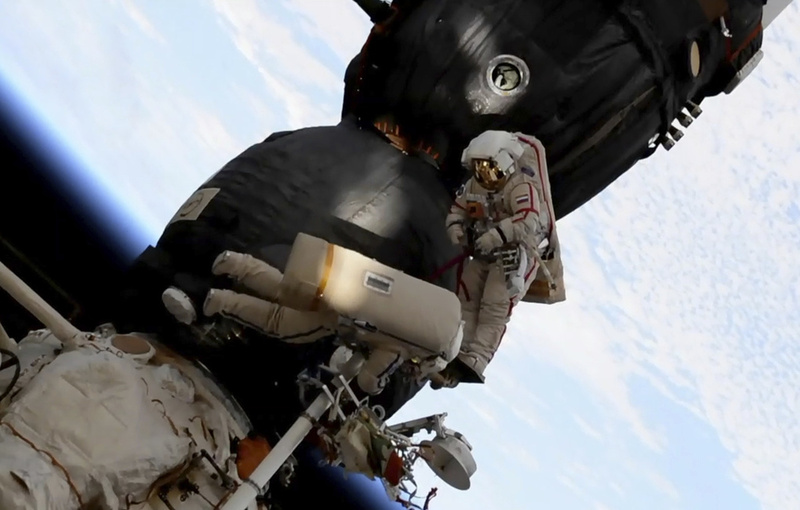 During the spacewalk, Kononenko is expected to unseal thermal insulation and the meteorite shield, inspect and make a photo of the hole in Soyuz. He will also scrape off samples from the hole’s surface and remove a part of the meteorite shield bearing traces of drilling. The Russian cosmonauts will send them aboard the same Soyuz MS-09 spacecraft to Earth on December 20 for further studies. 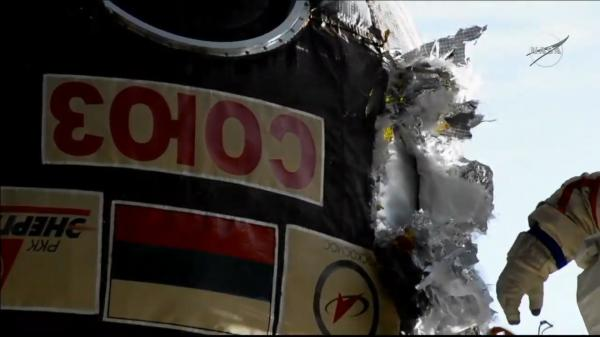 After that, Kononenko will patch the area with new thermal insulation material. "The astronauts have finished opening the thermal protection," - said the commentator in the MCC. 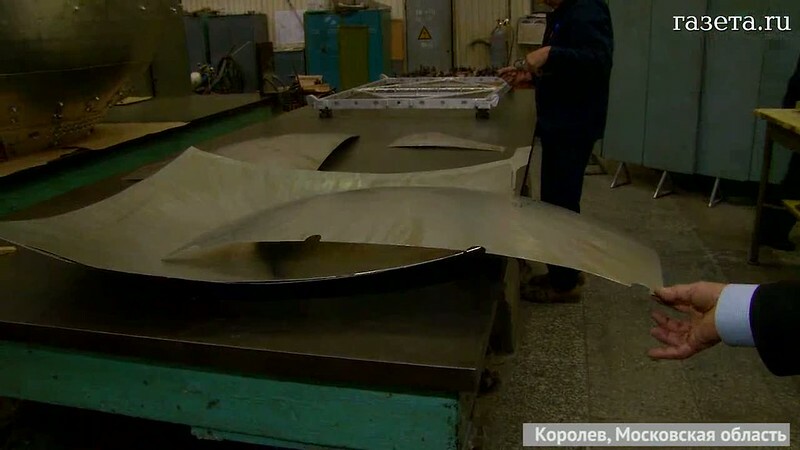 Now Kononenko is to open the metal of the meteoric protection under thermal insulation with scissors in order to get to the “hole” in the Soyuz. Then the astronaut will examine the hole, take a photograph and take samples from its surface for detailed analysis on Earth. He also has to cut off part of the anti-meteorite protection, where traces of the drill, which has traveled along its surface, must remain. After inspecting the hole, Kononenko should close the slot in the casing with new insulating material. 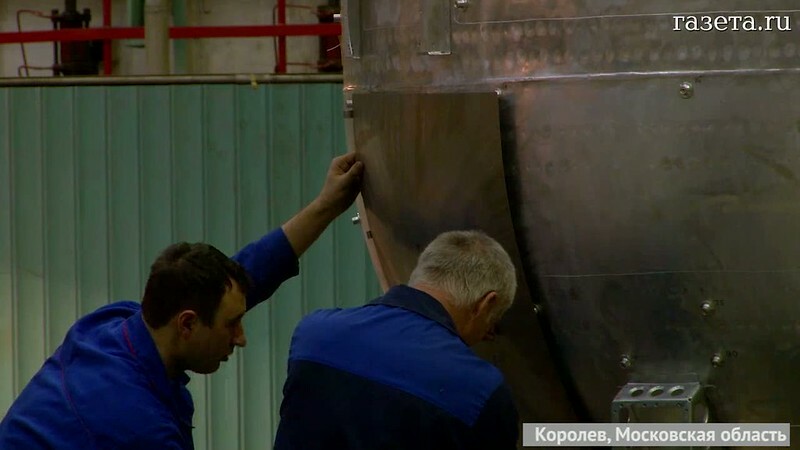 The main purpose of the operation is to determine whether the "hole" in the Soyuz was sealed from the outside with a sealant (during the inspection, a sealant or glue was not found inside the compartment). Question: What do these two materials (insulation, meteorite protection) look like, what are they made out of, and roughly how thick are they? The forums at nasaspaceflight.com have some stills captured from the NASA broadcast of the EVA. The cut and peeled back insulation is shown well in this shot. Not the answer you're looking for? Browse other questions tagged soyuz-spacecraft thermal meteorites insulation or ask your own question. What technical details exist about the Soyuz TMA spacecraft and its Simvol Displays & Cockpit Controls?